« Chargers’ Offensive Line is Best in NFL According to Scouts Inc.
Rushing: 43 Yards, 53 Carries, 0.8 avg., 8 1st Downs. Rushing: 49 Yards, 48 Carries, 1.0 avg., 8 1st Downs. Philip Rivers made his first NFL start against the Oakland Raiders in week 1 of the 06 season. He completed 8 passes on 11 attempts and threw one touchdown. Rivers played well throughout the entire season. 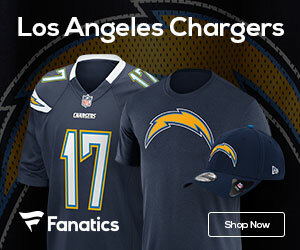 In 06′ Rivers posted the highest 4th quarter QB Rating in the NFL as he led the Chargers to numerous 4th quarter comebacks on their way to a 14-2 season. Rivers is the first quarterback in ACC history, 7th in NCAA history, to throw for 3,000 yards in three different seasons. He earned MVP in 5 bowl games, 4 with the wolfpack and 1 in the Senior Bowl. His jersey number 17 is retired at North Carolina State. In 2004 Rivers was named the ACC Athlete of the Year.